She’s a seasonal nature name with a rock ‘n’ roll edge. 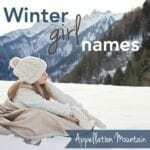 Thanks to Holly for suggesting her name as our Baby Name of the Day. The short story is that Holly is a nature name, borrowed from the evergreen, with its glossy leaves and red berries. Holly has long been a traditional Christmas decoration, and was sacred in pre-Christian Europe. Seasonal carols reference the plant. There’s “The Holly and the Ivy,” and we’ve been called to “Deck the Halls” with boughs of holly, too. The Old English holegn eventually became holin, and has been holly since the 1400s. It ultimately means to prick, as the leaves are spiky. Holly first charts as a girls’ name in 1936, entering the US Top 1000 at #981. She rose to the Top 300 by 1947, and was a Top 100 favorite from 1969 into the early 1990s. 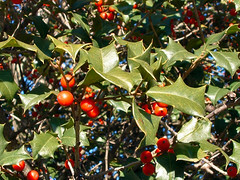 It would be easy to call Holly a modern nature name pick, borrowed straight from the plant for December-born daughters. 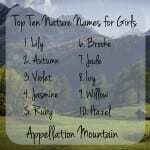 Except that Holly also charted as a boys’ name just a few times in the nineteenth century. The related Hollis is a surname for someone living near a grove of the trees, and has a long history of use as a given name. The Gaelic MacCuilinn is usually Anglicized to McCullen – but sometimes it is translated, to Holly. The most famous bearer of the surname was born Charles Holley. You know him as Buddy. He died tragically at the age of 22, but his impact on music was huge. Among the first inductees to the Rock and Roll Hall of Fame, Holly’s influence is considerable. Holly Hobbie, the real-life woman who created a fictional character by the same name. Hobbie was born Denise Holly Ulinskas in 1944. Hobbie is her married name. She introduced the character in the 1960s. The fictional Hobbie is a girl in a patchwork dress and an over-sized bonnet. From American Greetings cards, the illustration became a rag doll, a novel, and more recently, a Nick Jr. movie and DVD featuring a rebooted Holly in jeans instead of her traditional garb. Hobbie doesn’t get credit for making the name popular, but the attention didn’t hurt. Actor Jack Palance was ahead of the curve when he gave the name to his daughter in 1950. Audrey Hepburn played Holly Golightly in Breakfast at Tiffany’s. While it isn’t mentioned in the movie, the Truman Capote original gives her full name as Holiday. Actresses Holly Hunter, Holly Robinson Peete, and Holly Marie Combs have kept the name in the spotlight. Fictional characters abound, including Gwyneth Paltrow’s Holly Holiday on Glee. What still has me stumped is her rise in the first place. It’s clear that Breakfast at Tiffany’s helped tipped her into the Top 100, but Holly had been on a steady rise for decades. Today, she’s still popular in the UK and Australia, but in the US, Holly has faded, falling to #426 in 2011. She’s squarely in mom name territory today. But somehow, I don’t think she’s out of contention as a child’s name. With Lily and her botanical cousins so much in vogue, Holly might seem like a nature name possibility that stands out, but still fits in, for a daughter, especially one born around the winter holidays. We named our daughter, born in January, Holly, and she has appreciated that it is fairly uncommon yet not really esoteric name. It is rare, but not one that people think “odd name” about. She is the only Holly in her school (K-8), and I know she likes that her name stands out in a place overrun with Emilys, Elizabeths, and Rileys. What a great story about Holly and Ivey! I love my name, Holli, but I do wonder what it would have been like to have been given the more traditional spelling. I was born in the mid-80’s. I’ve only met one other Holli, but I do know a Holiday, Holley, and handful of Hollys. There’s also the YA author Holly Black. Her name seemed so perfectly suited to her writing style that I assumed it was a pseudonym, but no, it appears to be her married name. I like Holly, it’s a bit dated, but it’s a lot more interesting than Hayley or Emily. There is also the female fairy in the Artemis Fowl series, she is named Holly. Her character gives it a strong, independent feel to match the hardiness of the prickly plant. Holly makes me smile. Such a sweet name. 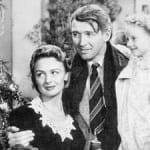 And I love Holiday (another musical namesake) as a long form, though Holly doesn’t necessarily need one. And I suppose I’ll mention my guilty pleasure long form: Hollyhock. The flowers are just so pretty, especially the black ones. And though I do see Holly as mostly feminine, I’ll say that I can see Holly on a boy, too. Probably because I’ve read a few books with male minor characters named Holly, and Buddy Holly doesn’t hurt that association either. The baby daughter on “Breaking Bad” is Holly. I thought it was kind of a surprising choice for a 2010-ish baby as it didn’t really fit current name trends. I grew up with a Holly so maybe that’s why it sounds more late 70s/80s to me. The first Holly I ever met was an American, born in 1946. 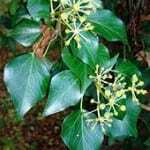 Now Holly is quite commonplace in the UK, and I’ve seen it given to honour grandmothers called Hilary. Personally, although I like Holly, I think those babies would have been better served with the more substantial and historical Hilary label! Jonquil, I’ve been thinking about Hilary a lot lately, and the idea of Holly from Hilary greatly increases my already-increasing affinity for the name. Megalady, I think Hilary is underused and underrated, but I’m not keen on Hillary which is surnamey to me.